Have you ever felt groggy and restless at the mid-point of a busy day? When things are moving along during a day that requires focus and productivity, people can sometimes grow sluggish and need a refresher. After a good night's sleep, the body has been restored and rejuvenated and you are ready to face the day. But as the day moves along, this feeling fades. Through this power nap hypnosis script, you will reap the benefits of a full night's sleep in a short period of time, any time you so desire. The script guides the client to a point where they will have the ability to feel the regenerated feeling after just a few minutes. While the body is not engaged in deep REM sleep, the mind believes that it is. The mind processes its surroundings as if it has had a full eight hours of sleep. The script also steers the practitioner in the direction of positive, motivated feelings, leaving them in that frame of mind post-nap. Those that practice this hypnotic power nap will awake feeling energized and refreshed. It will push away the feelings of tiredness in just a short time, and rekindle the just awakened feeling one has at the beginning of a productive day. Anyone that has had a night of sleep that has left them feeling truly rested can attest to the benefits of sleep. The body needs sleep, and while specific amounts needed vary from person to person, the average amount required is approximately eight hours per night. The body produces extra protein molecules while sleeping, and these help to heal your body on a cellular level. Things such as stress, pollutants, infection, and sun exposure are healed from these molecules. Researchers have found that proper sleep habits may aid in preventing cancer, weight loss and other disorders. Practitioners of the hypnotic power nap will also find that their proneness to experiencing a negative mindset will decrease. Since the brain is receiving the message that it is to perform all of the restoration of a regular night of sleep, these benefits will lead to a healthier and more relaxed outlook on life, reducing the overall possibility of developing depression and associated ailments. Sleep offers other benefits as well. It reduces stress, much like exercise and relaxation, and it helps heart health. Being sleep deprived can leave you with a foggy feeling which makes it difficult to concentrate. By getting a full night's rest, you will improve your ability to concentrate. Proper amounts of sleep can also help you lose weight. Sleep regulates the hormones that control your metabolism, and through proper amounts of rest, you will find that your metabolism is working at an ideal rate. After a brief hypnotic power nap, you will be more alert, more able to focus, and more able to gain success and learn. Now that the benefits of sleep are clear, it is obvious how fantastic it would be to gain these benefits in just a small period of time during the day through a hypnotic power nap. This script will allow you or your patient to gain the benefits of an entire eight hours of sleep, restoring the body to its prime condition, right in the middle of the afternoon. 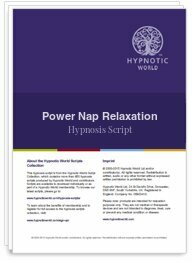 If you or your client is in need of something to help with their focus, restore their health, and freshen themselves for the challenges of a long day, this hypnotic power nap script will benefit the hypnotized subject in ways they are not able to imagine until they have experienced it for themselves.